This post will demonstrate how to auto increment on a column in PostgreSQL. For mgr_id, set as PRIMARY KEY and set the DEFAULT to NEXTVAL('mgr_id_seq') as shown below. Unlike PhpMyAdmin, PhpPgAdmin does not have a handy drop-down to auto increment a column when you create a table. 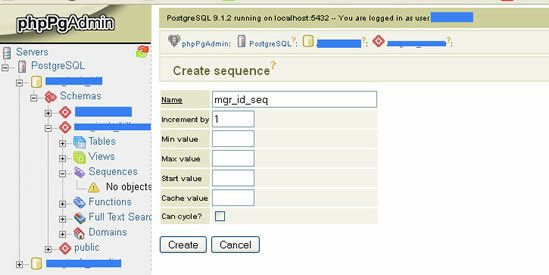 You can simply use the PhpPgAdmin SQL Editor to create the sequence and table as shown in steps 1 to 3 above.